Where can you obtain a Certificate of No Impediment? If you currently reside in the UK you should contact your local registry office and notify them of your intention to marry overseas. You may be asked to provide evidence of your nationality,address and name if there been any changes to this. Notice will then be given and the certificate will be issued after 21 days providing there is no objection. If you are a British National residing outside of the UK then you may need to contact the closest British embassy for further assistance. The CNI consists of 8 pieces of information for both parties-. 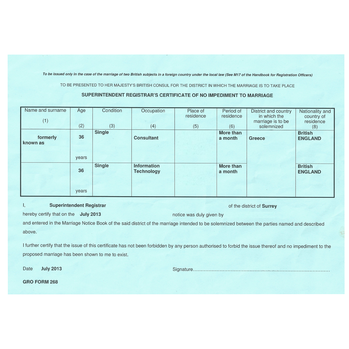 How to order an apostille for your Certificate of No Impediment? What other documents are needed? If you plan to marry overseas you may be asked to legalise various documents. This can often include birth certificates and sworn statements confirming your marital status. The requirements differ for each country and if you are not sure which documents require the apostille we recommend you contact your wedding organiser or the relevant embassy or consulate for advice.